No Springs Studios, developers of Windows Phone 7 apps, is proud to announce the availability of version 1.2 of Wordish. Wordish is one of the top selling Puzzle & Trivia games currently offered in the Windows Phone 7 Marketplace. This release includes a couple of minor bug fixes as well as an icon art tweak. Having been already downloaded over a thousand times and sustained a solid Marketplace rating of 4/5, Wordish is proving itself to be a fun and addictive word game in the style of solitaire. Wordish is a solitaire like game where players spell words to score points and remove letter tiles from randomly shuffled stacks. Players try to spell words by combining the top letter tile from any of eight stacks into a word. If the word is valid, then those tiles are removed, new tiles flipped over, and the word is scored. 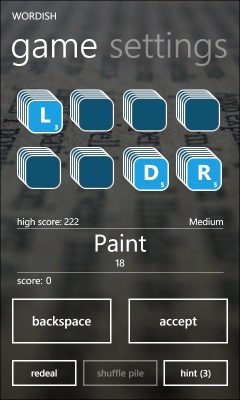 Scoring is based on letter values of the tiles used with bonuses for word length and creativity. 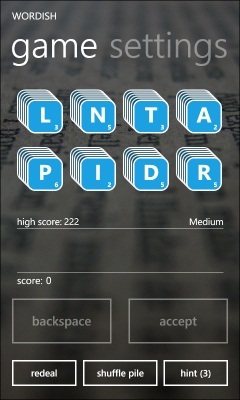 The game ends when no more words can be spelled using the available letters. Try to end the game having used all of the letters! Educational, strategic, and fun for the whole family. The free trial version is limited to Easy Difficulty level and only two word hints per game. Read more about the app at No Spring Studios here, and find Wordish in the Zune Marketplace here.